Successful savers view retirement savings through the lens of replacing current income in retirement. Defined contribution plans, like the 401(k), have become the primary source of retirement income for many workers. With the future solvency of Social Security unclear, a guaranteed source of income may be part of the next generation of workplace savings. The ability to generate income throughout a lifetime is truly the greatest mountain to climb when it comes to retirement planning. Achieving lifetime income is a deep concern of American workers. Numerous surveys note that most workers’ greatest fear about retirement is running out of money. Poverty and severe financial stress in old age are among the leading worries cited in many of these polls. In just a few decades, our national retirement system has made significant progress toward making that goal achievable for all individuals. Still, reliable lifetime income is not in reach for millions of Americans due to a lack of access to a workplace savings plan or an inability to save consistently. There is much work to do, but there is a path ahead. Combining the best policies and innovation from the public and private retirement systems will shape the next generation of retirement savings, and take us the rest of the way. 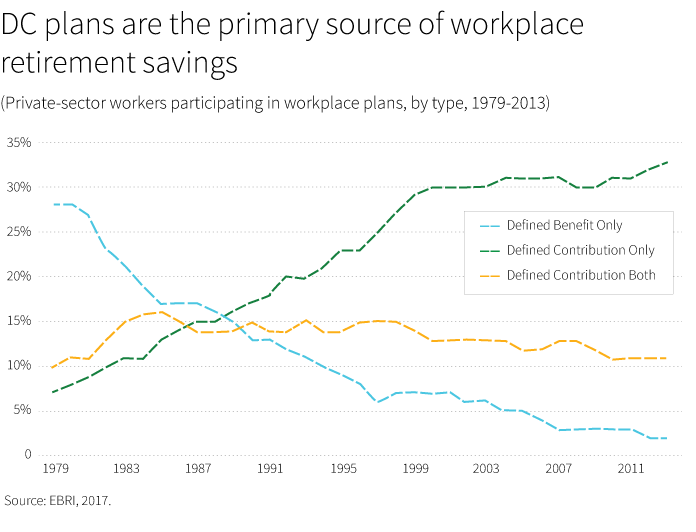 It’s not news that the availability of traditional pensions — defined benefit plans — has declined and that employer-sponsored defined contribution plans (DC) such as the 401(k) have become the primary source of retirement income for most workers. To keep pace with this growth, public policy has evolved to enhance the capabilities of DC plans. The Pension Protection Act of 2006 (PPA) opened the door to transform DC savings plans from their original purpose as a supplemental savings “perk” into a powerful engine for retirement income. We’re already seeing huge improvements in the capacity of DC plans to build up assets and significantly increase their capacity for income replacement. This is due, in large part, to the growing adoption of automatic plan features including auto-enrollment and auto-savings escalation. By overcoming one of the biggest human behavioral challenges — inertia — plan design has done more to get people engaged and saving. With a commitment to consistent saving, more workers are on track to replace their work salaries in retirement. Access is the most powerful factor, according to Empower’s Lifetime Income Study. In its 2016 survey, Empower found that workers on average were on track to replace 62% of their current income in retirement, if Social Security is included. To reach higher levels of income replacement, there are several key factors. The single most important variable is the sheer power of access to a workplace savings plan. Households without a payroll savings plan at work are projected to replace just 44% of their pre-retirement income. Households with a plan on average are on track to replace 79% of income. With the addition of auto-enrollment, auto-escalation, working with a plan advisor, and a deferral rate of 10% or higher, millions of savers are on track to replace 117% of their current salaries in retirement, the study demonstrated. Features of plan design have helped us make progress toward the goal, and continue to be implemented more widely. Sequence-of-returns risk. The timing of retirement may coincide with a market downturn that could impact savings. Inflation. Careful withdrawal strategies are needed to try to mitigate the impact of rising inflation. To tackle these challenges, we need a similar mix of market-driven innovation, academic research, and smart policy formation as we saw with the PPA. The hope is that DC plans can provide lifetime income predictability. Unlike most defined benefit plans, few DC plans include any assured or guaranteed income features. Unfortunately, there is no one- size- fits- all model for attaining guaranteed lifetime income, nor should there be in a dynamic and diverse marketplace. Fortunately, policy, academic, and industry stakeholders are already engaged in debate and experimentation to address the challenges of distribution and lifetime income. Broad agreement is emerging that we must expand the range of retirement income solutions in plans to include a full range of fixed, variable, and deferred-income annuities along with guaranteed payout plans that can be customized by investors and their financial advisors. Incorporating pooled lifetime income options such as annuities into DC plans could reduce every saver’s individual longevity risk and could limit the sequence-of-returns risk faced by retirees. Reforms are needed that can finish the job the PPA did so much to advance. With additional reform and innovation, we can advance the next generation of retirement savings plans that address the challenges of distribution and reliable lifetime income.